In my previous post, i mentioned 12 Solid Reasons Why I Should Have Got A Custom Domain Before . Now ill show the easy walk through by which you can easily setup a custom domain on Blogger, whether you get it from Blogger or some other domain host. 1-Where you should register a custom domain? The thing is, that there are so many domain host around. Ill list the best one here which i believe provide the best domain hosting services. Notice that if you can't get one online through credit card, you can always get one locally. You just need to consider those which provide free DNS controls along the domain hosting. Normally most of them provide free DNS settings control panel but still one can except the odd ones. After you will register your domain through the form on any domain host's website, you need to setup the DNS (domain name settings) for your domain. So its not like, registering the name and applying it directly to the Blogger Publishing pannel. (I'll explain that later in the post). I would recommend 'Godaddy' as they have the greatest package out there. With free unlimited email accounts etc Free email accounts mean that you would be allowed to make custom email accounts for your blog, like (contact@bloggingehow.com or support@bloggingehow.com). If you know any registrars with better packages, make sure to leave out their names in the comment section below. 2-What to do with DNS? Now that you register through the online registration forms of the domain hosts, you will get an email where they will send you the required User ID and Password to login to your domain control panel. 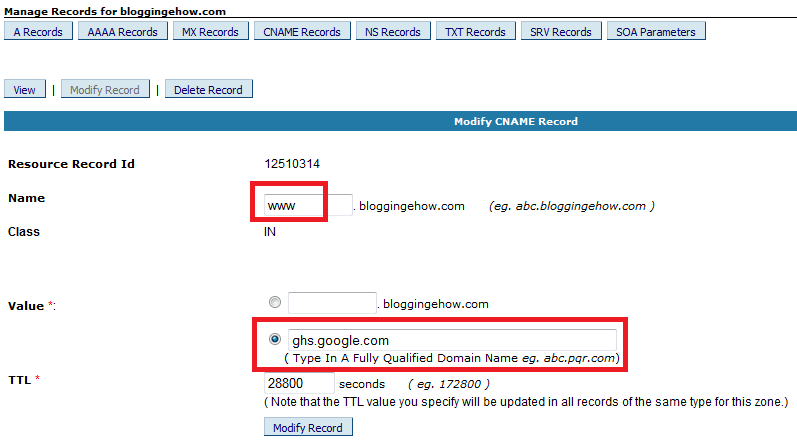 Ill give examples of BloggingeHow's domains host i.e 'Hostndomains'. The procedure is almost the same with all the domain registrars except that they might call a specific option in a different way. We will deal with that. Ok, so once you get into the control panel, you need to find a tab where it says DNS settings or something related to DNS. That's where we will set our domain settings. The DNS tab looks like this in 'HostnDomains' control panel below. Note that we are not their affiliates that we are promoting them. Its simply to give you an idea of the control panel. Hope it helps you out. I will attach a little video tutorial so that you get a clear idea of the control panel. Once you are in the DNS settings, you need to setup something called 'CName'. You will find a tab or button related to that in the DNS settings. Click that and go to the link where it says 'Add new' or something related. We just want to add a new CName for our domain. where it asks for value/target host/destination/record. 'ghs' stands for Google Hosting Service. 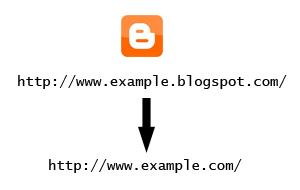 As your blog is Blogger Hosted (free hosting) you need to enter the host address. If your blog is hosted with some other company like 'Hostgator' your value would be different. Now that its done, click save. It will take around 1-2 day (normally takes less than a day) to activate your DNS settings. How will you know that your DNS is activated? Ok so now that our blog is ready to be added to Blogger's Settings panel, you have to go to Dashboard >> Settings >> Publishing. Now go to custom domain >> Switch to advance settings. If you bought the custom domain from Blogger you don't need to go to the advance settings and you simply had to set it up from custom domain panel. You need to enter your domain name as follows in 'Your Domain' field. Important part is the sub domain that is (third level sub domain www). If you would not enter www and just enter yourdomainname.com Blogger will give you error. Now tick the redirect box and save changes. It will take around 6-7 hours for the redirection to complete. My redirection was complete in less than 3 hours. That's all!. Hope that was helpful. For any problems that you face, leave out the your comment below.